In the year 2013, as a successor to E Type, Jaguar introduced its F-Type with a soft-convertible followed by a coupe in the coming year. For the same year 2013 it shared its Jaguar F-Type Project 7 Concept. 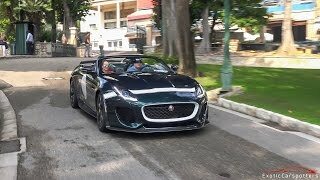 Moving with the time two year later, company unveiled the all new production ready Jaguar F-Type Project 7 2015 with new features and looks commissioned by Jaguar Special Vehicle Operations. 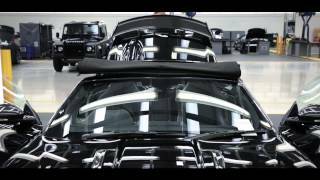 Let us have a look at the review of Jaguar F-Type Project 7 2015 and see what all it has inside and out. Interior of Jaguar F-Type Project 7 2015 unlike its concept comes with two seats, which includes a passenger seat also. Made from lightweight material the race-inspired sporty bucket seats are quilted in diamond pattern with white stitching adding to its looks. The same stitching essence further spreads its wings covering the center console, side bolsters and door panels subsequently adding to remarkable looks in the black interior. The Jaguar F-Type Project 7 2015 interior gets its unique sports car touch through the machined aluminum paddles and carbon-fiber veneer inserts while the door-sills feature ‘Project 7’ graphics in light-blue color. Paddles reside behind Alcantara stitched leather wrapped steering wheel giving you both looks and proper hold. Exterior of Jaguar F-Type Project 7 2015 holds very much resemblances with the revealed concept. However there are slight changes that we noticed in the bumper wrapping wide front splitter and a reshaped spoiler mounted at the rear end accompanied by a foldable roof that will store itself in boot area positioned in middle of these two. The exterior of Jaguar F-Type Project 7 2015 comes with five colors with white decal options Ultra Blue, Caldera Red, British Racing Green while Ultimate Black and Glacier White come with grey decal options. 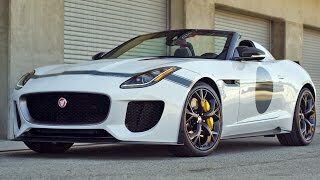 Jaguar F-Type Project 7 2015 gets its new set of three-spoke wheels rolling through a 5.0 Liter V8 engine delivering total output of 575 hp and peak torque of 680 nm mated to eight-speed Quickshift transmission. 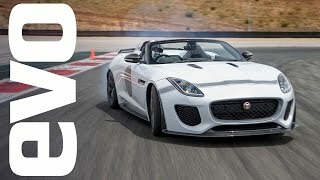 With this power rolling the entire Jaguar F-Type Project 7 2015, it reaches a top speed of electronically limited 186 mph while the 0-60 mph sprint comes to be at 3.8 seconds.